Here are the 20 most unique baby names we saw in November! 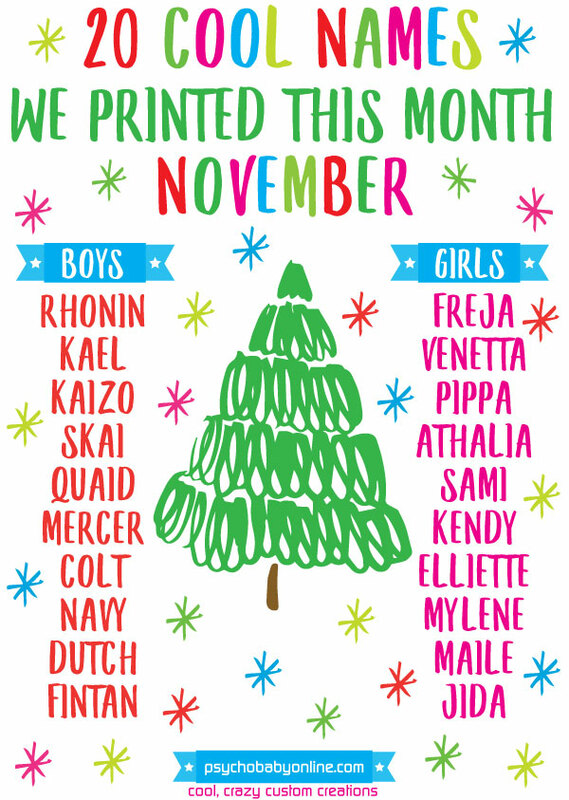 It’s our busiest season, leading up to the holidays, so we are seeing more cool and crazy names than ever before. Strong boy names and fancy girlie names – we’re fans of both with a shoutout to Colt, Dutch, Quaid for the little dudes and Elliette, Athalia and Pippa for the little ladies. FOURTH month in a row that we’ve seen more brand new names than ever… add Venetta, Fintan, Mylene, Kendy, Skai, Athalia, Rhonin, and Kaizo to our list of “first ever” sightings! We’re in the thick of it now, so pull out that list and get ready to check it twice – we’ve got you covered for the coolest personalized baby gifts and personalized kids gifts whether the kiddos are naughty or nice! HELP! How Do I Cook This Turkey? Help! How do I cook this turkey? Which turkey should I get? 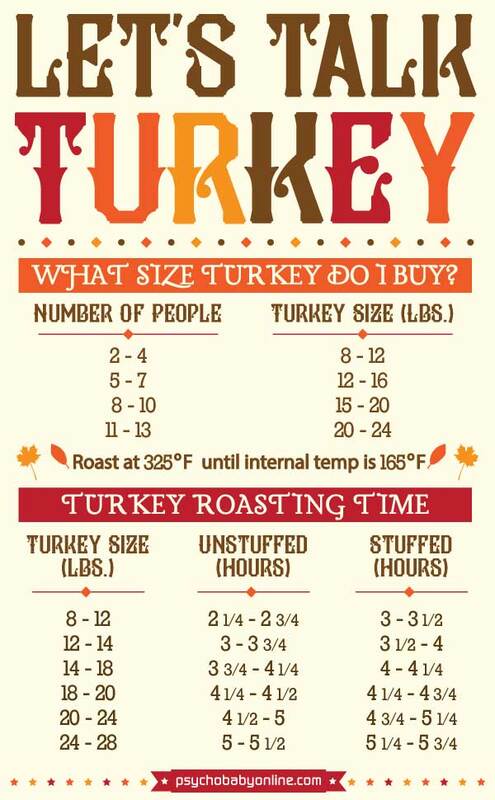 Well, we weren’t sure either, so here’s a handy dandy guide to help you out this Thanksgiving. Also available as a tea towel (Let’s Talk Turkey Kitchen Towel), so you will never have to crack open that dusty cookbook or Google it again! For something fun to do while you wait for your bird to cook – click here to download our free printable “I Am Thankful For” cards – have everyone fill one out and then read them aloud! Good luck with the cooking and have an awesome T-Day! 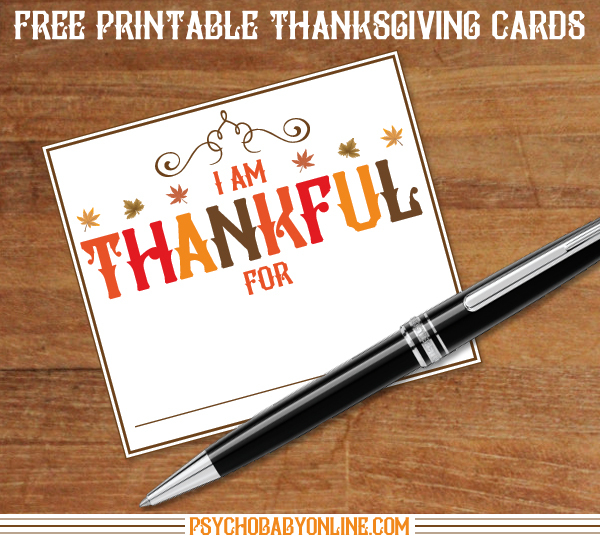 These free printable “I am Thankful for” cards are a cute and fun way for your friends and family to share what they are grateful for this year! This PDF is sized to print on regular letter size paper or white cardstock and will yield 6 cards per page. Simply download, print, and cut apart! Chicago friends: Share the holiday spirit by supporting Humboldt Park’s Association House and their Holiday Smiles Toy Drive! Bring an unwrapped gift in to our Custom Shop for the gift drive and receive 20% off your next purchase at Psychobaby! See below for a list of items they are hoping to collect to make this year merry for many Chicago kiddos in need. Please bring your unwrapped item(s) in by December 7th. We are open Weds-Sat from 11-6PM. Visit associationhouse.org for more info on all the services they offer our community! Out of all the things that I cook, this Zucchini Pie Recipe is the number one recipe that I get asked to share! My mother in law gave me this recipe over 15 years ago and I have been making it ever since. It has become a favorite side at Thanksgiving and an easy weeknight meal with the addition of a salad and some bread. I shortened the recipe a bit to fit on our custom recipe towel but have written it in detail below. Enjoy! Preheat oven to 350 degrees and grease a 13 x 19 inch baking dish. In a food processor, shred zucchini. You can also shred zucchini with a hand shredder. Transfer to a bowl. In a food processor fitted with a blade, pulse onion and parsley until very finely chopped or even almost pureed. You can also chop both the onion and parsley by hand but I have found the food processor to be faster and I prefer the texture. Transfer into the bowl with zucchini. Add mixture to your greased baking dish and bake for 40. minutes or until lightly brown on the top.